Situated at a formidable height of 4,039 feet above sea level, the lofty summit of Mount Sunflower is the highest point in the state of Kansas, the United States. Yet, it’s barely noticeable and virtually indistinguishable from the surrounding plain. There is no peak here that you can stand upon and take in the breathtaking view. Just a small bump in the middle of a private ranch located half a mile from the Colorado border. Mount Sunflower is perhaps the only 4,000-plus-feet peak that you can climb by driving. 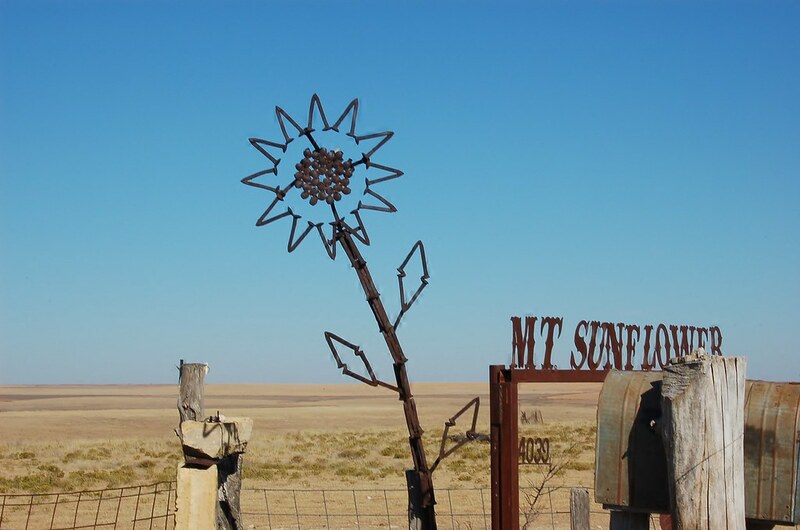 At the “top”, there is a small shrine containing a metal sculpture of a sunflower—Kansas’s state flower, a covered picnic area, a memorial to the Harold family who has been homesteading here since 1905, and a mail box with a guest book inside. Kansas may be flatter than a pancake, but it is also tipped to the west causing the state to rise gradually but consistently upward by more than 3,300 feet towards the Rocky Mountains over 200 miles to the west. As the Rocky Mountains lifted during the Cenozoic Period, approximately 66 million to 1.6 million years ago, streams flowing eastward out of the Rocky Mountains deposited vast quantities sand, gravel, silt, and other rock debris into the valleys and eventually covered the hills, creating a huge, gently sloping floodplain. This region is known as the High Plains, and is actually a sub-region of the Great Plains encompassing most of the Central United States. Mount Sunflower is located at the western end of Kansas. 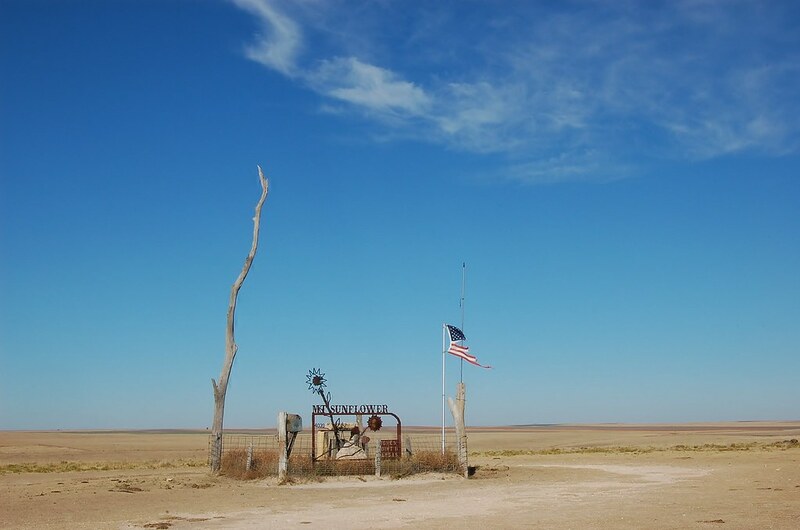 Beyond this high point, the High Plains continue to rise until it hits the Rocky Mountains in Colorado.